When we moved to Saipan in June, we brought six trunks of stuff with us. Things that made the bring-with-us cut? 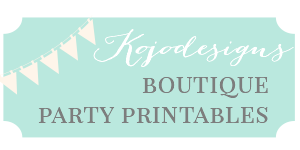 Clothes (not many, but I still wish I would’ve pared even more), Legos, a few of Piper’s dolls and purses, my sewing machine, a small bundle of fabric and a few party supplies. Nothing seasonal/Christmas-y made its way across the ocean with us. We did inherit a fake tree, but are lacking in the décor department. 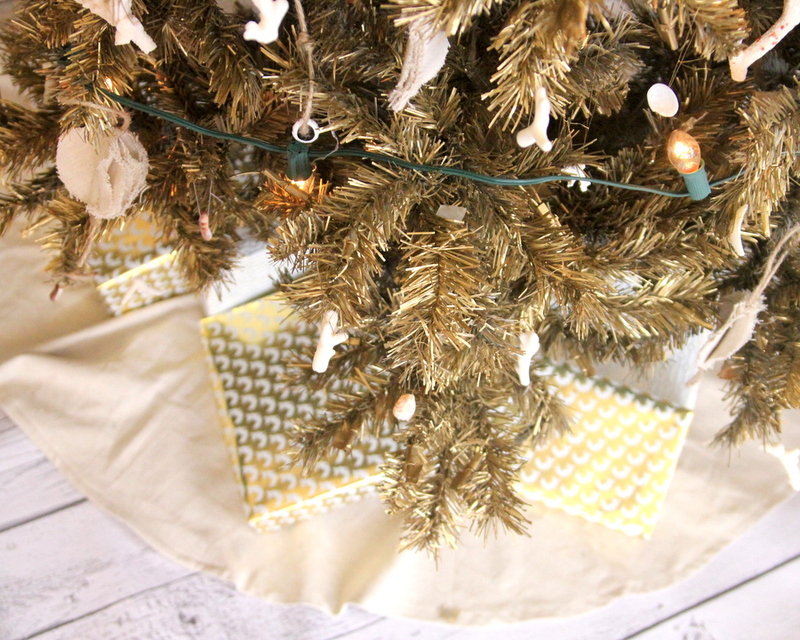 Since all of my options for making Christmas ornaments are white and tan, I had my heart set on making the inherited-tree gold. 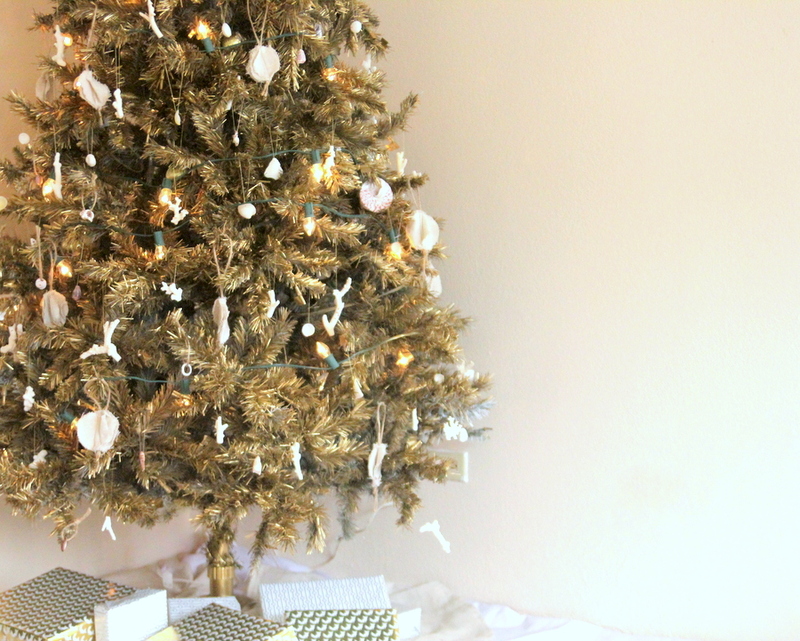 After using fifteen cans of white spray paint to make the tree white-ish/gray (good thing white spray paint is cheap), we added a couple coats of metallic gold spray paint on top. -Spray from every angle for the the best coverage. Also, turn the tree parts upside down. -Focus your efforts on the angles that you see the most (aka- cover the tops of the bottom branches, straight on for the middle of the tree, and looking up at the top portion). 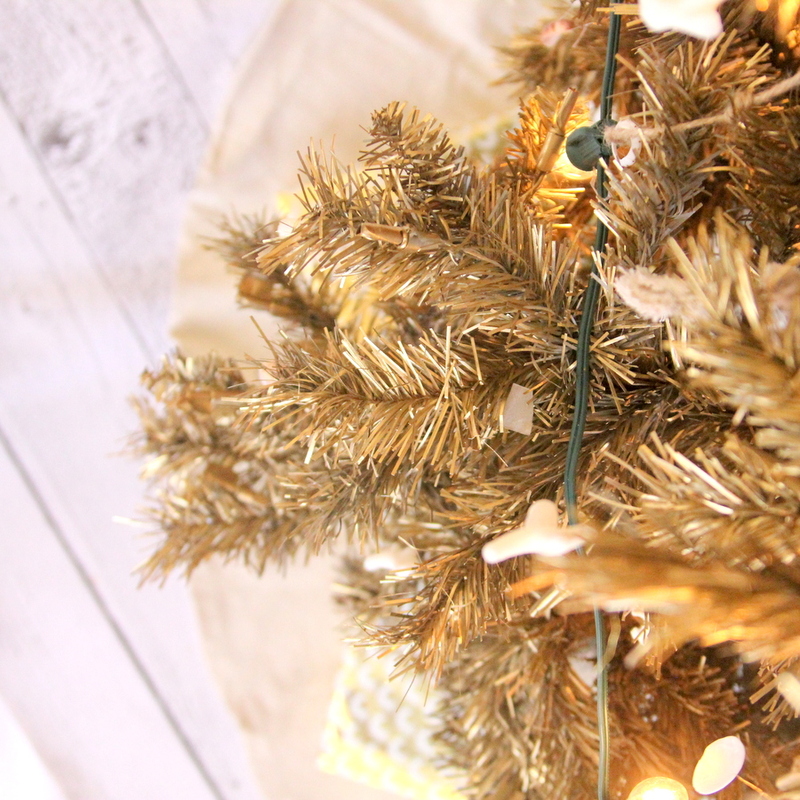 -Tape off the lights if your tree is pre-lit. 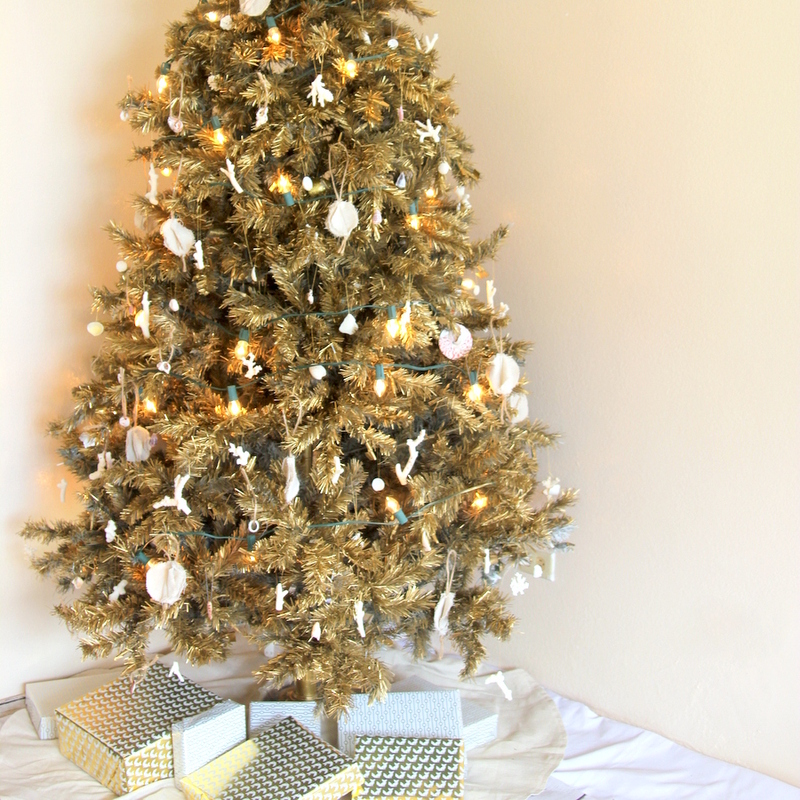 Better yet, use a tree that isn’t pre-lit and forego the taping and untaping. 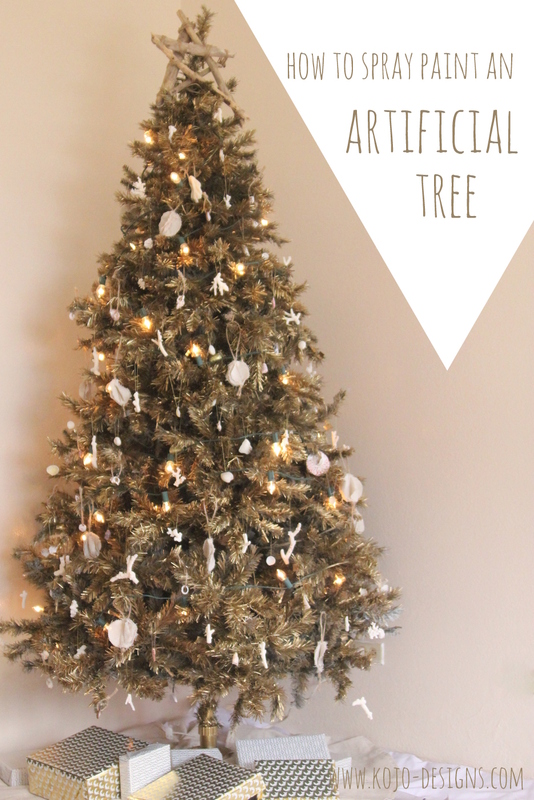 -Use a white tree if you can (I couldn’t get ahold of one here, but it’d skip the whole white-spray-paint step and you’d have better results). 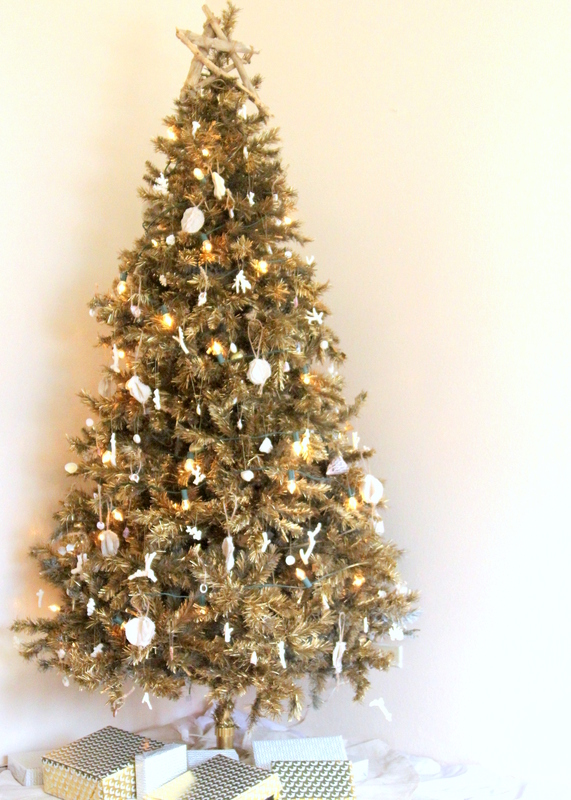 Strung up with coral and shells, and a drift wood star, it is the perfect Christmas tree for our island home. We are definitely not finished decorating, but it’s a start. Cheers to an extra sparkly Christmas! 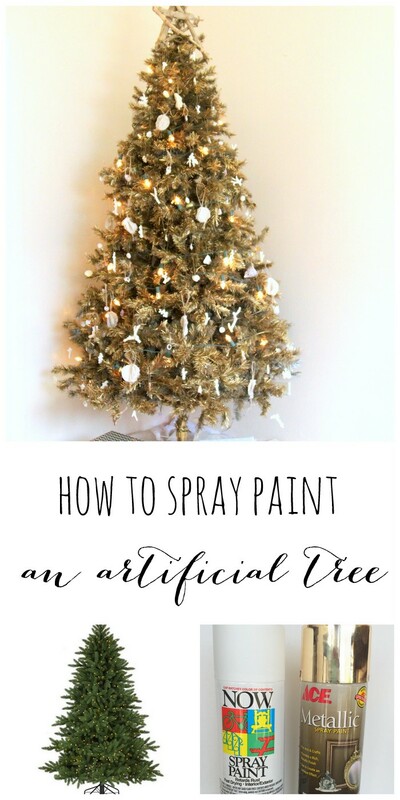 ps- You could leave the tree white, or use spray paint in any color! Piper would love a pink tree (ok, so would I)… so many possibilities! Just found your site and I love this tree! How did you eliminate the spray paint odor? I spray painted a tree but the smell is so awful. It over powers the room 🙁 Any tips on getting rid of the smell would be appreciated!! Hey George- hmmmm, ours didn’t have an odor. I let it sit outside for days after I painted it- maybe that helped??? What spray.paint is best to spray paint a green artificial tree to pink. Hey Pat, I don’t know… I used Krylon spray paint, and it worked great. Maybe you could try that in pink?